Patch to SCS900 v2.71 version. þ The release of SCS900 v2.71 (build number 94) has a bug which does not load the external application DLL thus preventing the SonarMite application working. This has been fixed by Trimble and released as an update patch in SCS900 (v2.71 build number 95 or later). 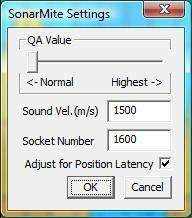 SonarMite application software (SCS900 v2.5 version). þ To avoid the problems associated with applications working in forthcoming updates to these operating systems the applications have been compiled as 'standalone' with no dependence on version specific extensions to the environment. þ The Trimble ACU/TCU versions have been dropped as the WinCe Operating System requires a specific compiler and software developers kit which does not warrant the low demand and high level of support required. Speed of Sound - The user can set the sound velocity value between 1400-1600m/sec, the default setting being 1500 m/sec. Socket Number – The socket number used to transmit the data between applications (PC version only), default updated to #1600 to avoid confusion with earlier SCS900 versions. Latency Calculation - The user can enable/disable the Latency correction algorithm within the SCS900 extension module, unless the system is using SCS900 to measure positions this function is inoperative. The SCS900 extension dll is called by the main application and passed a position with a timestamp, the SonarMite extension dll adjusts the depth based on the depth timestamps to suit the timing of the position, this calculated depth is then subtracted from the current position Z value (or height) and returned to the main SCS900 application. As the extension dll receives its data via serial transmission and timestamps it on reception of the Linefeed character, the calculation of the delay from the depth 'start ping' time and subtracts it from the applied depth timestamp. CustomDataField 3 = Time between Position and Depth (milliseconds). These values can be used to reconstitute the original data if required and also estimate the applied time shift and depth QA value. The simulation mode in menu DEVICE/TEST DATA/ has been updated to send a timestamp with the simulated depth message. This helps configure or demonstrate the system without the need for a physical SonarMite to be connected. SCS900 would be used in turbid water conditions in a construction environment. It would be unlikely the software would be used in depths greater than 25m. As there were several situations in which this was not the case and data was filtered out the QA filter slider has been modified for a wider range of operation and that a windows error beep is also sounded if data fails to pass the filter settings. Previously the slider filter point ranged from QA values 80 to 110, the new settings are set for a range of 40 through to 100. Turbidity - Quality of water in the column under the transducer. Relection – The ‘hardness’ of the bottom surface. Sound Velocity – The transmission speed of sound in water. 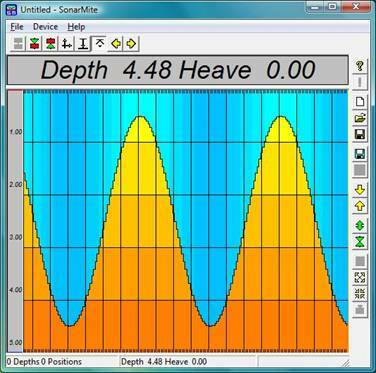 Depth – The total depth the sound has to travel through the water. þ þ Auto enumeration of COM: ports. The PC software has been modified to detect and auto enumerate com ports when making a serial connection to the SonarMite. This gets over the technical problems with port numbers greater than 10 in Winows Vista and Windows 7. The PDA version is still limited to ports COM1 to COM10.